Research Institute on Progress Monitoring: home page. Produced by the Research Institute on Progress Monitoring (Grant No. H324H030003) awarded to the Institute on Community Integration (UCEDD), College of Education and Human Development, at the University of Minnesota, by the Office of Special Education Programs. The Office of Special Education Programs (OSEP) funded the Research Institute on Progress Monitoring (RIPM) to develop a system of progress monitoring to evaluate effects of individualized instruction on access to and progress within the general education curriculum. RIPM's funded activities have ended and the center is now disseminating the findings from its five years of research and development. The Institute is housed at the Institute on Community Integration and the Department of Educational Psychology, Special Education in the College of Education and Human Development at the University of Minnesota. Iowa State University for Science and Technology is a lead collaborator in this research. Curriculum-Based Measurement - A simple set of procedures for repeated measurement of student growth toward long-range instructional goals. 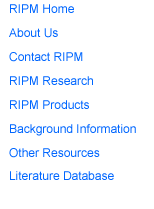 RIPM Technical Reports now listed in Products section.